Let me state at the outset that, notwithstanding the deficiencies of my own vocabulary, I am very fond of browsing dictionaries, thesauri, history of languages, and the like. Languages have rules, words origins - and together they form a thread in our cultural heritage. The new book by Anthony Lo Bello will not exactly fill a gap in my library, but it will occupy a deservedly prominent place on my bookshelves. The valuable work of Schwartzman (The Words of Mathematics, MAA, 1994) may be consulted with benefit by anyone who looks into this book, and such an investigator will notice the ways in which I differ from the learned colleague: I have retained the Greek and Arabic alphabets to avoid the dark and doubtful consequences of transliteration, I have sat in judgment on the correctness of the words I explain, and I have used my license to be discursive to discuss not only the function of mathematics in liberal education but also English usage among mathematicians and their colleagues in the learned world. Mathematicians who are teachers regularly adopt the bureaucratic mentality as they function within their colleges and universities. By doing so they torpedo their own ship and demonstrate that they do not understand the meaning of their own profession. They thereby contribute to the decline in the estimation in which the society holds their profession. All mathematics begins with definitions, so that first observation to be made about a mathematician is that he is the sort of a person who requires that all technical terms be defined, and that all common words be used properly in accordance with their accepted meanings. So, whereas I understand the point the author attempts to make, I feel that the point of view expressed in the latter quotation might have been adopted by a bureaucratic teacher whose attitude the author is censoring later on. I believe (and think many will agree with me) that, although it is impossible to underestimate the role of definitions in mathematical discourse (and actually in any other kind of communication between us humans), in the work of a mathematician definitions often come late in the process, as a means of organizing the results and sharing with the community. Humanity defers in such matters to those with taste, and only those with no taste write abelian. By their unnatural ugliness and comical pomposity, such words betray themselves to the reader, be his intelligence ever so little. Really? Somehow I am sure that thousands of reasonably intelligent mathematicians just have absorbed the words as they are and moved along. Regarding the words "Numb3rs" the author says that "the combination of letters and numbers ... to form concoctions attractive to people with no taste is strongly to be deplored." And later on, "the use of English words numerate and numeracy to mean able to handle numbers and ability to handle numbers ... contradicts knowledge..." That's outright hilarious. I am confident that after J. A. Paulos coined the term in 1988 the term got adopted by a vast majority of mathematics teachers and their official representatives, say the NCTM. To wind up, the book is a rather complete dictionary of mathematical terms, with well explained usage and etymology. This is a remarkably interesting book. I found the author's judgments entertaining more than offending, and partly justified. I recommend the book without reservations. 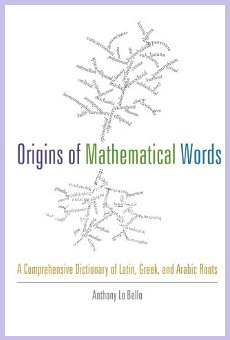 Origins of Mathematical Words: A Comprehensive Dictionary of Latin, Greek, and Arabic Roots, John Hopkins University Press, (November 8, 2013). Softcover, 368 pp, $44.96. ISBN 1421410982.